Member : CHF 270.- per trimestre*. The fees are due all year (12 months). Cancelling must be done one month in advance. For payment use Postcheck account: Tai-Chi CCP 23-2750-4. * Membership entitles students to the participation in all classes in Marin and/or La Chaux-de-Fonds. A regular participation is strongly recommended. Our school teaches awareness of the Tai-Chi Chuan origins being a martial art. When self-defense was the only way to protect the loved ones and one's goods, fighting techniques were crucial and had to be spontaneous. Applications today help understand the movements of Tai-Chi Chuan and bring direction and intent into the solo form, which are helpful attributes in daily life as well. The first approach to applications in our school are just simple demonstrations on how one move or just a part of it could work in a fighting situation. Later on, the students are encouraged to research and find many applications for individual moves. We practice different push-hand patterns from Yang, Chen and Wu styles as well as free-style push-hands with fixed and moving steps. Partner work takes an important part in our school, starting with very simple exercises and games leading eventually to push-hands. All our participants practice tui-shou in order to learn to face different persons and adjust to spontaneous situations - a very useful day to day skill ! 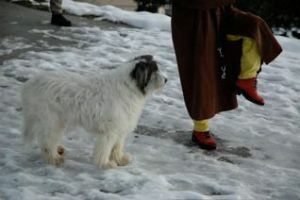 It is also a way of testing ones acquired Tai-Chi techniques in the solo-form as well as an excellent opportunity to practice joy and vigilance. We use many different Chi-Kung exercises from slow stretching to standing to small forms and sound chi-kung to tune in and warm up. Chi-Kung, in our school, makes an integral part of each lesson. We practice some partner forms, choreographed San-Shou, the small San-Shou 24 steps, and the big Yang-style San-Shou. 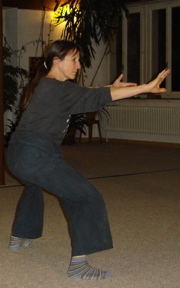 These forms improve the understanding of tai-chi chuan movement. The martial applications put the movements into context. They bring the gestures to a conclusion and therefore precision into the energetic movement. This form has been choreographed by Cornelia Gruber-Bilgeri. It helps to get past the tendency of only dancing through a Tai-Chi form and puts the fan where it belongs :as a credible weapon in line with swords and sabers and poles. This is a form of 42 movements which has been created by Fu Chen-Shung. Fu's fame being mostly for his Bagua skills, his form shows some Bagua influence in his family style Tai-Chi Chuan. He has paid close attention to balancing left and right and also has included his very special rippling step in this Tai-Chi form. This form is the creation of Fu Chen-Shung. The name Liang Yi (two kinds) is very descriptive since this form is a combination of Tai-Chi and Bagua techniques. It is a form of 81 movements practiced in an expansive and elastic manner with some sharp focal points. Liang Yi Chuan will have a harmonizing effect of the energy flow on the whole body. This form has been created in 1950, during a series of meetings of several contemporary Tai-Chi masters with the goal to create standardized forms for China. It contains characteristics of several styles like Yang (open elegance), Wu (compactness), Sun ( swiftness), Chen ( explosive movements) and Fu (left + right sided with rippling steps). 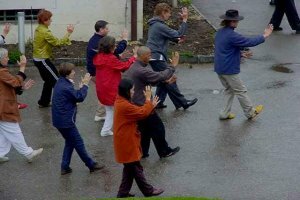 These styles have been combined into a happy marriage, expressing harmony and power all the while holding its own as one of the modern Tai-Chi styles. The form takes 20 minutes at a comfortably, slow speed and can also be practiced in 6 minutes only at a more advanced level. 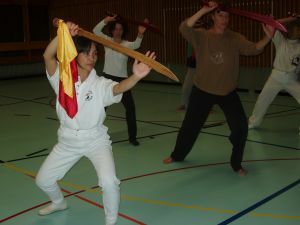 The sword is considered the crown of the Tai-Chi weapons and therefore demanding a high level practice. This form consists of 54 movements and must be performed in a smooth and clear way without hesitation. The sword is a noble weapon with three sides of attack, two sharp edges and the point. Its practice sharpens concentration, discernment and decisiveness. Our school carries on the Wu Dang techniques as they had been taught by General Lee King-Lin to Fu Wing Fay and on to Bow Sim Mark. This form of 48 movements has been created by Sifu Bow Sim Mark. The fan has a very tonifying quality and its manipulation in both hands stimulates all the meridians of the body (comparable to the Qi Gong balls). Its focalized movements produce a variety of sounds coming from the fan and add to the power of this form. 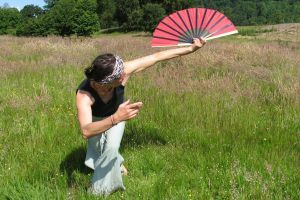 The dragon fan also has some Bagua influence in its stepping and twisting manner. The fan enhances vigor and joy. The Tai-Chi broad sword requires the strength of combat coupled with the elegance of tai-chi chuan. The movements are ferocious while maintaining the calm and continuity characteristic of tai-chi chuan. The broad sword movement lets one express an ancient innate force and to act out one's own suppressed warrior nature. We practice the form with 33 movements divided in 4 sections.